It all started during a leisurely November breakfast with friends. 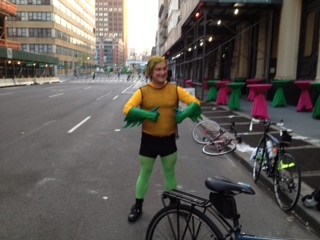 Glen mentioned he wanted to do the New York City Five Boro Bike Ride. We impetuously agreed to train and join him. A short six months later, six friends gathered in New York for the May 5th event – five riders and one volunteer as this was yet another event quashed by my late winter injury. I drew a 5 a.m. shift at a VIP area set up two blocks from the start. Tasked with keeping tables cleared as one set of riders replaced another, I chatted with charity riders. Arriving bicycles included a mix of state-of-the-art road bikes, recumbents and ellipticals. I had a view of 32,000 cyclists off for the 40-mile ride. My team was in the first wave, departing at 7:45, but somehow I missed seeing them. The DDL Team is there somewhere. Several hours later, I received a text that three of our 5-person team had passed the 20-mile mark before they were swept from the course and loaded on a bus. I quickly made my way to the Staten Island Ferry, not knowing I would be waiting three to four hours before they arrived at the finish. My team on the bus showed a great deal of patience. I did not. When I knew they were close, I left the terminal to locate the bike rental drop. The rental bike staff were loading up their trucks, so I alerted them that at least three rental bikes were still out on the course. To no avail. After some vague comment about leaving one truck, they suddenly pulled away with no signs of returning. Minutes later, I spotted my group along with several other riders approaching on their bikes. After a call to Bike ‘n Roll, they instructed that bikes now must be returned to the Battery Park location. 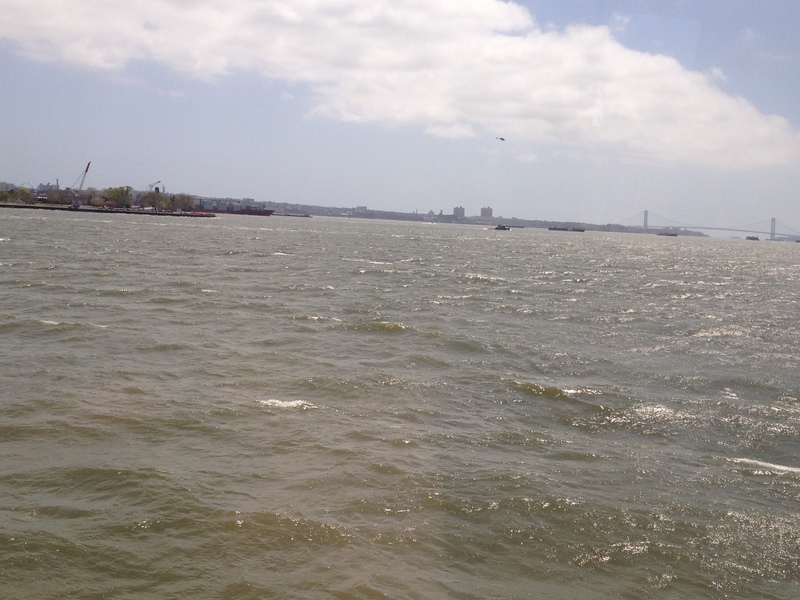 A cool, windy trip on the ferry. So, rather than drop their rental bikes on Staten Island as prearranged, then warming up in the terminal, riders now had to wait in the cold to load with their bikes on the lower level of the ferry. On the Staten Island Ferry, we were very cold, but somewhat merry. And what of the two additional friends in our group? They had a fantastic day finishing the course. 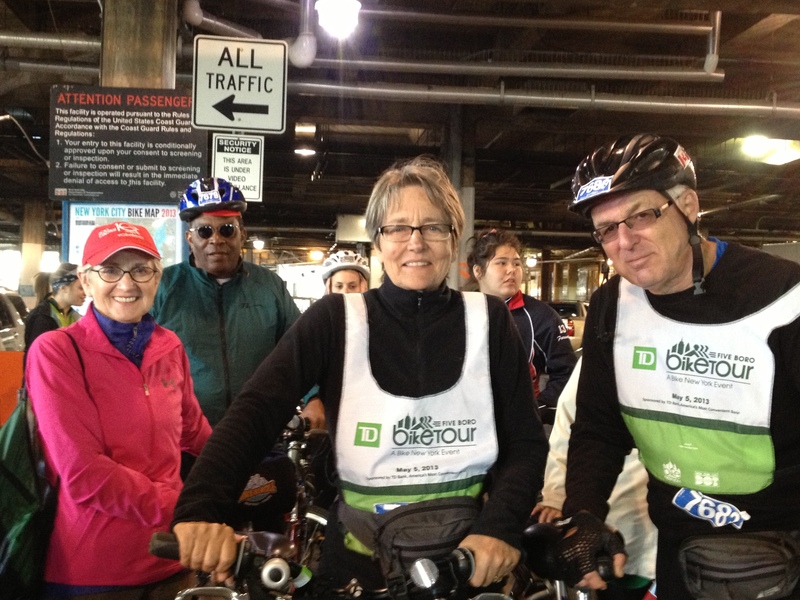 Aside from a temporary holdup leaving the festival at mile 36, and the expected period of time waiting in the bike line to board the ferry, they had a smooth and scenic ride. We didn’t say a proper good-bye since they had left their hotel and were having pizza with friends in Connecticut before we returned to Manhattan. Oh, well. We learned so much through this experience. 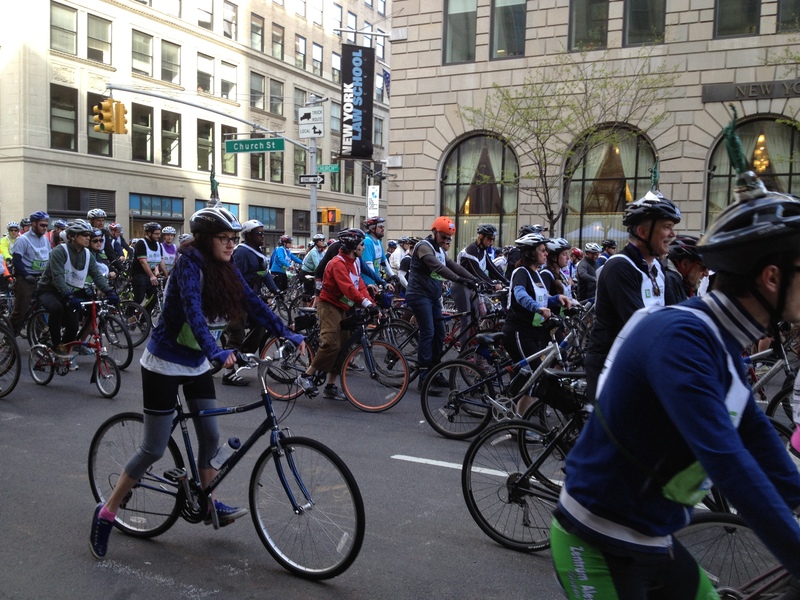 The 5-Boro Bike Ride raises funds for biking education. Additionally, NYC has a bike share program that is about to begin and the City has been very aggressive in expanding bike lanes. I also concluded that large rides are likely not for me. As a runner, I can’t imagine being swept on a distance run, then sitting on a bus for hours before arriving at a point where I could get to the finish line or another destination. But then, I don’t run with a bike in tow. I’ll stick with running (for now). 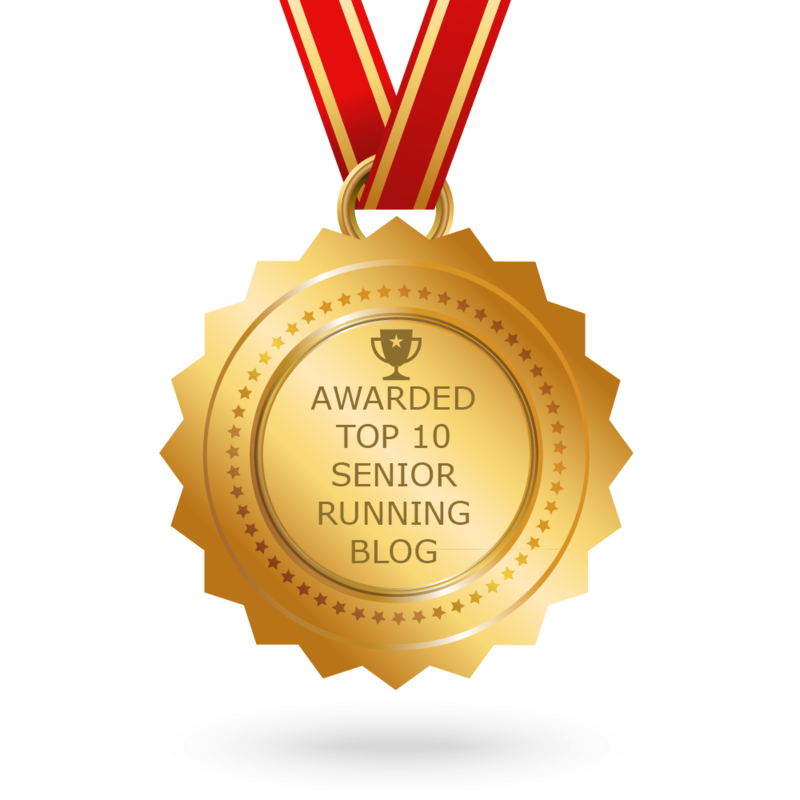 Since this senior runner always incorporates food and exploration in any travel, look for more NYC in a subsequent post. This looks like great fun! And what a crowd. Awesome. Yeah, fresh air, exercise and interesting people. The Brooklyn Bridge return sounds like a great plan. I’ll keep it in mind if I do it next year. My volunteer service (how did I draw that 5 a.m. slot?) earned me a guaranteed entry. Grimaldi’s sounds wonderful. NY is such a great food city.I have a post drafted on the restaurant/food stops over the 5-boro weekend.